Bombardier corporate aircraft. Photos. Framable Color Prints and Posters. Digital Sharp Images. Aviation Gifts. Slide Shows. Bombardier C Series CS300 (BD-500-1A11) C-FFDK (msn 55001) (first flight) YMX (Gilbert Hechema). Image: 926534. 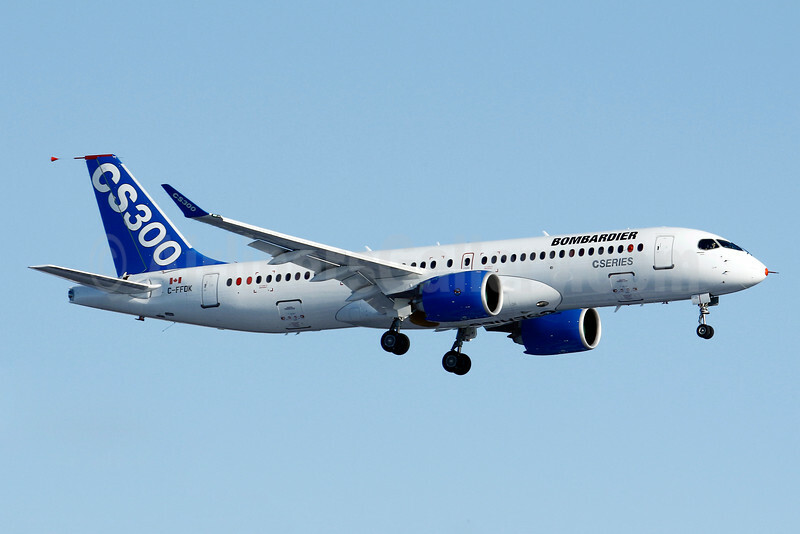 Another major milestone in Bombardier’s CSeries aircraft program was reached on February 27 with the maiden flight of the CS300 airliner. The technologically advanced CSeries aircraft will provide operators with an all-new family of single-aisle mainline jets specifically designed for the 100- to 149-seat market segment. The CS300 airliner – bearing Canadian registration markings C-FFDK – departed Montréal–Mirabel International Airport at 11:00 EST and returned at 15:58 EST. It reached an altitude of 41,000 feet (12,500 metres) and a speed of 255 knots (470 km/h). At Bombardier’s Mirabel, Québec facility, some 2,000 Bombardier employees, Board members, partners, suppliers and customers braved frigid temperatures to witness the flight. Capt. Andris (Andy) Litavniks, who was the co-pilot on the historic maiden flight of the smaller CS100 model on September 16, 2013, was pilot-in-command on today’s milestone flight. Capt. Litavniks was assisted by co-pilot Christophe Marchand and flight test engineers Anthony Dunne and Mark Metivet. The CS300 aircraft offers the best seat-mile cost in its category, making it the most profitable solution for mid-sized markets with up to 150 passengers per flight, and ideal for a range of routes from short-haul to longer transcontinental markets.